As if recreational mud bogging in the South weren’t enough, adding some real live competition to the mud and the yee-haws has made the sport that much more enjoyable. Down there in Florida, of course, Soggy Bottom Motor Sports Park is located on the Florida-Georgia line in Macclenny, Florida. It is one of the best off-road riding and family outdoor recreational parks around with 180 acre outdoor recreational park, only 30 minutes from West Jacksonville. 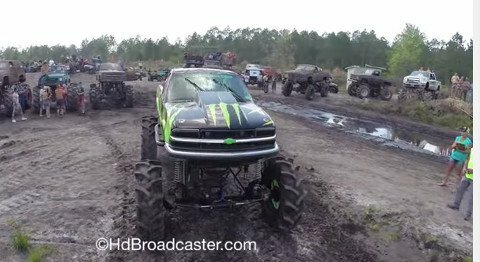 The competition, through a giant mud trench known as The Bounty Hole, pits the most robust of mud bog enthusiasts against one another in a sprint race to see who makes it to the other side. More often than not, an otherwise large truck is rendered small once it becomes hopelessly trapped in the black mud of the Bounty Hole, having become a victim of its own churning tires. To be sure, watching The Bounty Hole races is loud, muddy, and generally hilarious. While this race is sort of loosely defined in terms of rules, the general idea is to last longer than the other drivers. Of course, while you’re at the park, you might as well enjoy the other amenities as well. There are night bogs, camping, sand drag racing, live music and general fun for the family. Or not. The Bounty Hole race is a little racier than that. Footage from past races show crowds of competitors, some atop their rigs and some down in the mud, wearing a range of headgear, from orange hard hats to treebark cammo boonie hats, milling about while engines idle, passing around canned beers. “Is that how you get ready?” asked the voice from behind the camera. His question is answered with a distracted, “Whoo!” Next up is an interior shot of a competitor named Bubba Newberry. “In the Bubbaliscious truck,” he declares. Bubba made it about eight feet into the Bounty Hole before getting mired in the muck. “He didn’t have a big enough motor,” observed one commentator.